Rinse well in a colander and then dry them in a salad spinner to remove all liquid. In a large mixing bowl, add flour, eggs, salt and pepper and combine. Using your hands, make a thin patty of the potato mixture, four inches in diameter. 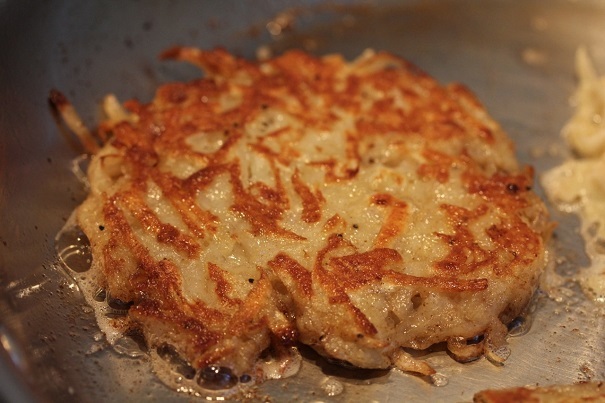 In a large frying pan, melt half the butter in medium heat and fry first batch of latkes, about 2 minute on each side, flattening them with a spatula as they cook. They should be a crispy golden brown. Remove from heat and drain on paper towels, then place in a warm oven while making the hollandaise and eggs. Heat four inches of water in a large, shallow pan. Add 2 teaspoons vinegar and ½ teaspoon salt to water and heat to a simmer. Slip four individual eggs into the simmering water and poach eggs to runny stage. Remove to a bowl of ice water to stop cooking. Trim wispy edges of eggs with kitchen scissors. Repeat with second batch of eggs. To reheat eggs: simmer a pan of water on the stove. When ready to serve eggs, put into simmering water and heat about thirty seconds to warm through, but do not overcook yolks. Combine egg yolks, water, lemon juice and salt in a blender or mixing bowl. Melt butter in a saucepan over high heat, swirling constantly – do not allow butter to brown. With blender on low speed, slowly pour butter into egg mixture until it is fully mixed in. By the time all butter is incorporated, mixture should be thickened and creamy. Add salt and pepper to taste and serve immediately, or keep warm in a small pot until serving. Do not allow hollandaise to cool, or it will separate. 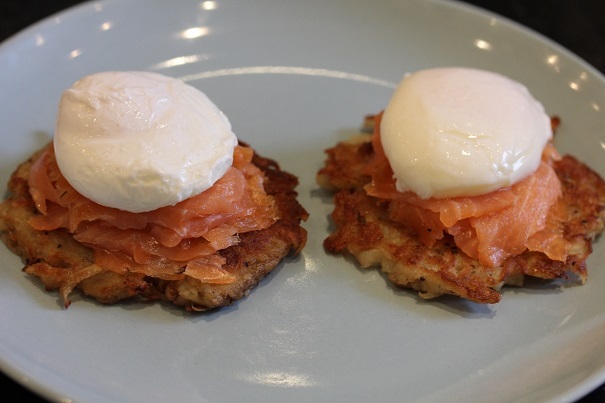 Put two latkes on a plate. Cover with slices of smoked salmon, approximately 3 ½ inches in diameter. 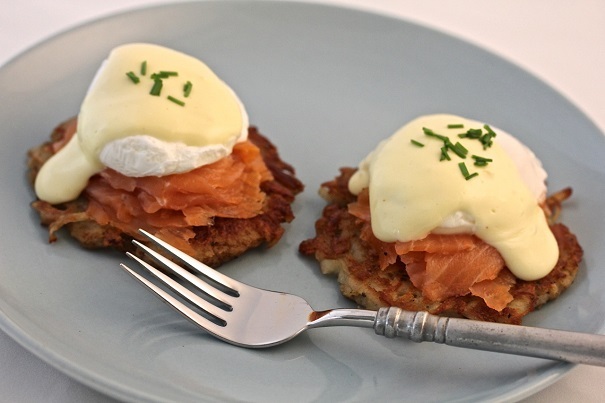 Gently place poached eggs on top of salmon. Pour hot hollandaise over eggs.